Sometimes change is hard, even when it’s necessary. I tried to put this off as long as I could, but the truth is – it’s time. It’s time for my Web site to get a new look! So although the technical things that could go wrong make me very nervous about this Web site change (I’m doing this myself, y’all), I’m still going to do it. Today, I’m going to tell you the 3 reasons I’m giving I gave my Web site a makeover. I know some people spell Web site as one word. I’ve seen it spelled the way I spell it here and as one word so many times, I don’t know which is right or if they’re both right. So I just picked one. That aside, lets get to those reasons. 1. To make it easier for you. When you come to my Web site, I want you to be able to find the things you’re looking for with ease. I also want you to feel welcome and stay a while. I plan to make things more organized so you’ll always know where you’re going and how to get there. Clutter, confusion and chaos will be unwelcome in this space. They’re only allowed in our sewing room, lol. 2. To make it easier for me. Oh, that sounds a little selfish, doesn’t it? But it’s really not, I promise. If things are easier for me, they’ll be better for you. I hear you asking yourself, “How so, Katrina?”. So let me explain myself. Right now, I spend a lot of time doing things manually that will be done automatically with an updated Web site. For example, whenever I do a new patternmaking tutorial, I manually resize and add images and links to the tutorial page one by one. (See the current tutorial page below.) On the new site, as soon as I post a new tutorial, the image will automatically be resized and added to the tutorials page. This is by no means a complaint. 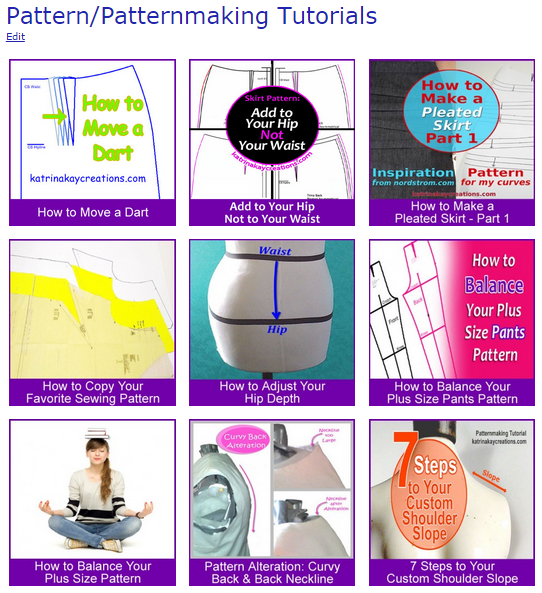 I love blogging and sharing sewing/patternmaking information with you. I just need to do things more efficiently because the more time I spend doing manual stuff, the less time I spend creating tutorials and blog posts for you – which is what I’d rather be doing. 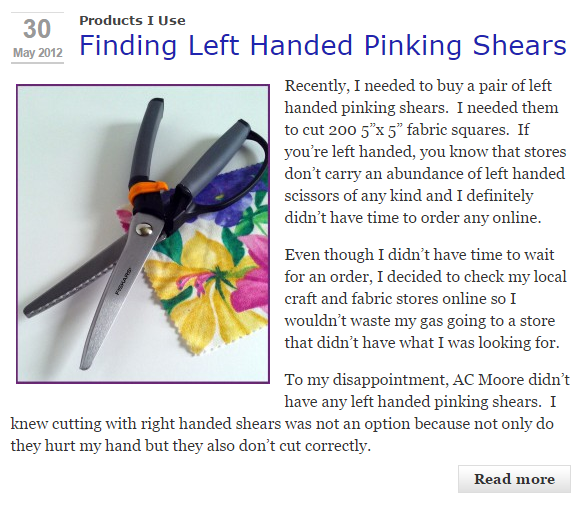 I’ll get more things done and you’ll get more tutorials to help you with your sewing/patternmaking challenges. That’s why, all fear of technical issues aside, I’m doing a happy dance over this Web site makeover. Even though I teach through my blog, I’ve also learned so much. I didn’t know what the heck I was doing. I just started. I didn’t know what was going to happen, but I knew I had to start. And I am soooo glad I did. If I hadn’t, I would not have been able to connect with and learn from you as well. So, believe me when I tell you, change is good. And not only is change good, it’s necessary for growth. I want our community to grow. I want our sewing/patternmaking knowledge and skill to grow. As a side note, in addition to the Web site makeover, something else got a makeover too. My logo! Here’s a peek. When will this Web site makeover happen? I’m glad you asked. The changes to my Web site will take place from Thursday, August 27th to Sunday, August 30th. I know that’s quite a few days, but I want to make sure I give myself enough time to get everything done. If you’re on my email list, I’ll be sending you a reminder of these dates next week. I will also send you an email as soon as the site is live on Monday, August 31st. Please be patient with me, you guys, as I make this transition. Thank you so much for taking this journey with me. Web site makeover, here we come! Do you have questions or thoughts on this makeover? Leave them in the comments below. Congratulations, Katrina, on taking this step. Your tutorials have helped me in the past and I look forward to continuing to use your website. Thank you, Jean. I look forward to creating more for you to use. I’m so glad my tutorials have helped you and I’m grateful for your support. I can’t wait to see your new site! It will be AWESOME!!! I’m sure it will all turn out just fine! Thank you for all your dedication and hard work! You’re welcome, Loretta. It doesn’t feel like hard work because I love what I do. Thanks so much for your confidence and encouragement. THIS WILL BE AWESOME!!!!!!!! I Am so very happy for you and you will have all my support! No fears I know YOU CAN DO THIS!! Thank you so much, Leslie. You all have had such encouraging words. I’m grateful for your support and I’m so motivated. Thursday can’t get here fast enough! Applause for your success and bravery! I too am starting the blogging journey due to be unable to work at a conventional job because of health reasons. Sewing is only one of my creative passions and I so appreciate you sewing and creating for those of us who do not fall within the “normal” sewing pattern sizing. Best wishes and keep up the incredible work! Bobbie, I’m so glad you’re starting the blogging journey. 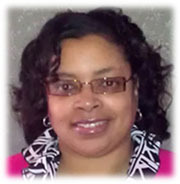 I wish I’d had some guidance when I started so I’d like to share a good resource with you – http://byregina.com/start/. When you go to this link, scroll down to “Starting or Growing A Blog”. She has several free resources on starting a blog. I’m so sorry you have to deal with health problems and I’m praying that your healing and good health will come quickly. I hope being unable to work a conventional job gives you an opportunity to do what you love and also make a living if that’s your goal. Go Katrina! I always enjoy your tutorials and your words of encouragement. I think many of us can agree that change is hard but can be good, just as you said. Wishing you the best! I’m so glad you enjoy my tutorials, Mary. Thank you so much for your encouragement and well wishes, and also your support. This blog would be nothing without all of you! Congratulations, Katrina. Go for it. When I had a website, I created it myself, so I know what a major undertaking this is for you. Good luck! Thanks so much for your encouragement Jo Anna. Everyone’s encouraging words are so motivating. I can’t wait to just do it. Go for it! Love your tutorials, so more is better. Good luck, and looking forward to the new “KKC”. Thanks so much, Primrose. I can’t wait to spend more time creating. And I can’t wait to show you the new KKC. I’ll definitely be open to everyone’s feedback. Very exciting (and brave!) – looking forward to seeing your ‘new look’. Julia. I wish I could hire someone to do it, but I have plenty of DIY help in place. Thanks so much for your support. I am very excited to see your new web site. I have been following you for a while. I know change is hard but It will be for the better. Wishing you luck! Yes, Bonnie, it will definitely be for the better. Thanks for your encouragement, excitement and for following me. I really appreciate it!